Attach yourself to people not to apps. 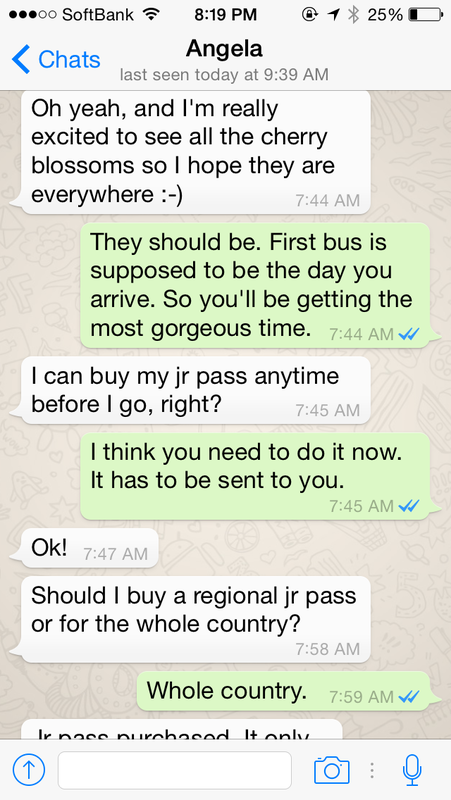 Had a text conversation on WhatsApp with my college roommate about her visit from Chicago to Japan in a couple of weeks. 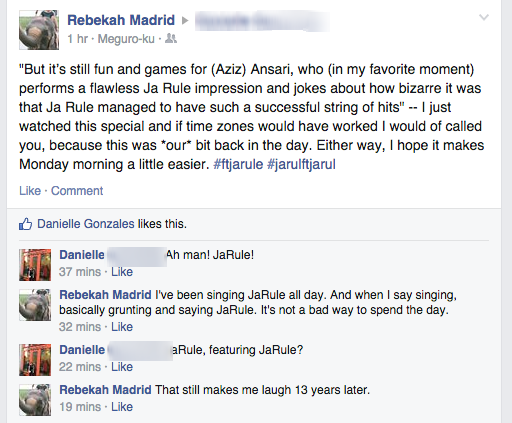 Had a Facebook conversation with another old roommate who lives in Washington DC about JaRule and his music circa 2001. 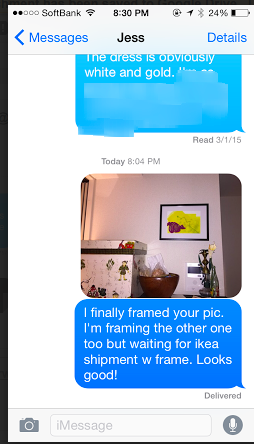 Had a iMessage conversation with my sister in London about a piece of art of hers I finally framed. Also, a very important discussion about The Dress. Emailed with a teacher (who I don’t know but met on Twitter) in Sydney about setting up a Skype conversation with her class and mine to talk about Japanese culture. 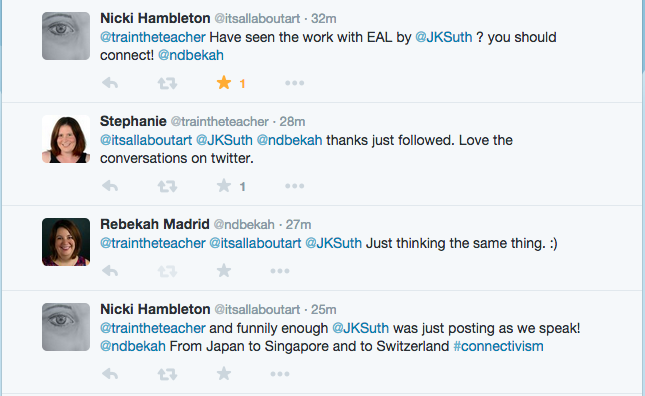 Had an amazing Twitter conversation with @traintheteacher (Singapore), @itsallaboutart (Singapore), @wayfaringpath (Thailand), and @JKSuth (Switzerland) about visual note-taking. There is no rhyme or reason to why I choose a certain app to talk to a person. I flit between Twitter, FB, WhatsApp, iMessage. I’m as happy on FaceTime as I am on Skype as I am Google Hangout. I don’t think about what I’m using. I’m only thinking about talking and communicating and sharing. Some of the ideas are silly and some are important (JaRule is important). But I live in magical times where I can talk to all my favorite people in many different ways in many different spaces..
And this is what our kids do. They do not care what tool they use. They have no loyalty to any app or any product. They just want to talk. I’ve got a post brewing about our Digital Citizenship Week and how we track what apps our kids are using. And if there is one thing I know, what is the app for sharing and communicating today will be dead tomorrow. So don’t get attached to any one space. The way you talk to the people around the world, strangers and friends, doesn’t matter. Do get attached to people and to ideas. Because they are what matter most. 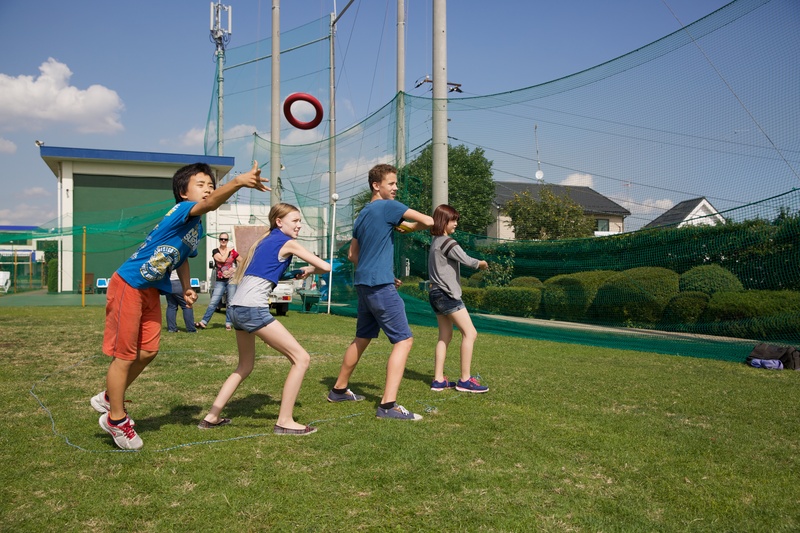 There are are lot of words written about how we need to get our kids to move. 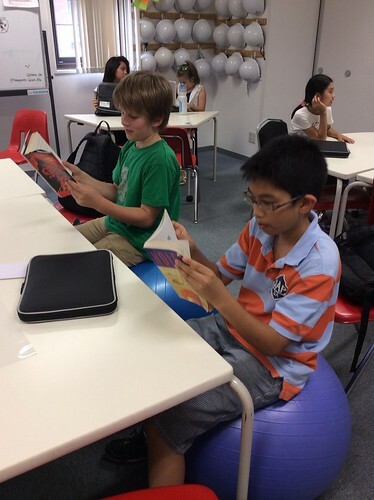 I always feel vaguely guilty about making kids sit on the red plastic chairs I have in my classroom. 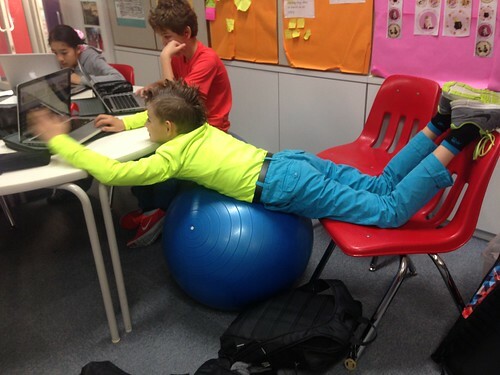 I try to get my kids to move, but I know from my own school days that those chairs are uncomfortable. 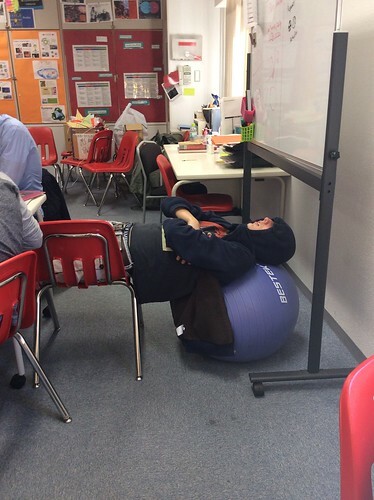 So two years ago, on a whim, I bought two giant yoga balls to try out as replacements for chairs in my classroom. I’m now up to four exercise balls, of different sizes. It’s really been a case of asking forgiveness not permission. I’m sure the lovely cleaning lady is annoyed by these balls when she’s vacuuming the mess the kids leave behind. And I know the bouncing can drive my principal crazy when he stops by the room (though he’s never ever asked me to get rid of them to his credit). Other teachers have looked at me like I’ve lost my mind. And all the bouncing can make me dizzy. But if I could, I would have 10 more in my room. This is how my kids sit. These guys came in one day and just started stretching. I wish they did this more often. Grade 7. That takes core strength to sit on the ball on your knees. Sometimes even the adults when meeting in my room will sit on them. And in the two years I’ve had them, I’ve noticed a few things. Not all kids like to sit on them, but a lot of them do. They have figured out their own system for sharing the balls and over the course of a week the majority of kids will have had their turn on the ball. And sometimes, on grading heavy days, I like to sit on them too. Boys really like them. There have been a lot of studies and articles written about how traditional schools do not benefit boys who often need to move more than we allow them to. 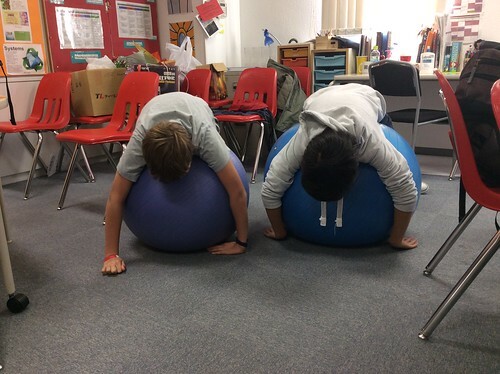 The bouncy balls let them move, stretch, and change their sitting position when they feel like it. And anecdotally, I honestly think it helps them focus. Of course my girls love the bouncy balls. But there is a reason a lot of the photos above are of boys. They are rarely distracting. They are literally part of the furniture. You’ll have to trust me on this. They are sitting much better and this helps alleviate some of my guilt for when they are spending so much time on their laptops. 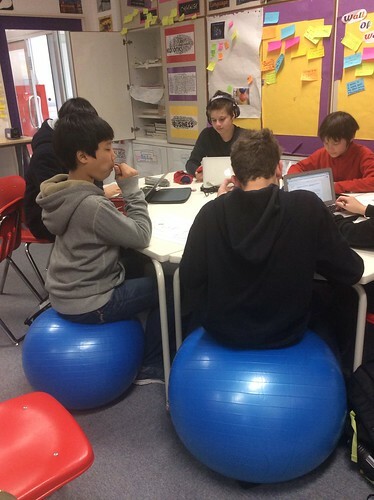 The bouncy balls force them to sit upright and use their core. Otherwise they fall off. In a related note, I’ve never had a kid hurt themselves falling off a ball. 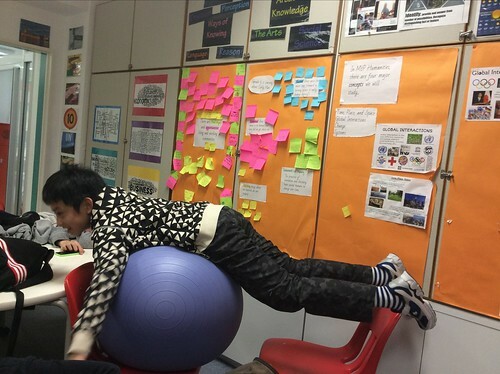 It’s spreading…since I’ve gotten them I know there is a yoga ball in the grade 1, grade 5, learning support and in the counselor’s office. 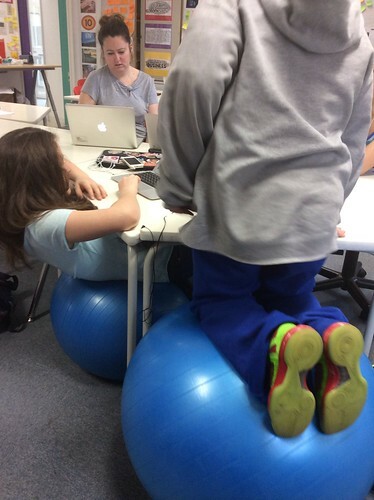 I wish (and my kids wish) there more were in middle school classrooms but the bouncy ball revolution is happening. 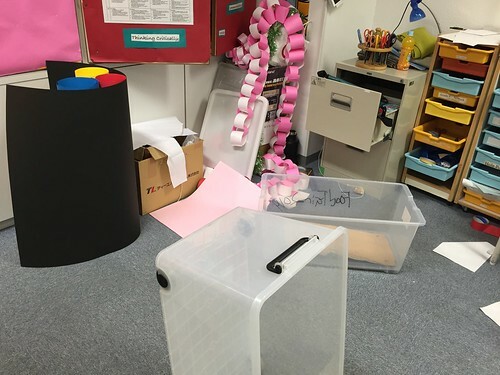 My classroom often looks like this. A mess. A disaster. Craft supplies everywhere. Boxes that contain things like cans of helium, a disco ball, and a witches hat. And it often looks like this at lunch time. Kids running around making messes. And talking loudly/screaming. They were in my room today during lunch making messes and making noise. Student Council kids getting ready for Digital Citizenship Week. Dance committee kids get ready for this Friday’s dance. And they didn’t have to be there. I didn’t ask them to come. They were just here. So I asked them, “Why are you here?” What makes them want to give up lunch to do work? I love the chaos of getting ready for dances and assemblies and all the other things we do. I am constantly telling these students how happy they make me. And they come because they like feeling part of something. And they come because they feel responsible and they care for other students. The projects have value and the deadlines are real. They come because they are the ones in charge. And they come because it’s fun. 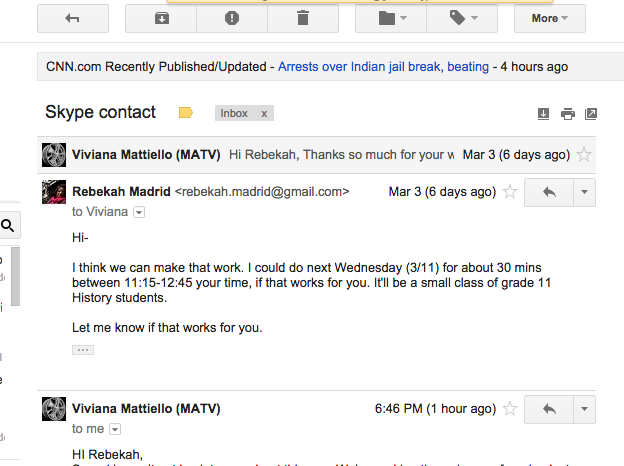 And sometimes I wonder how I can translate to the other places where I get to interact with my students. I do know that the decorations committee will be here Friday before school and Digital Citizenship committee will be here on Thursday. Not because it’s required. But because they want to. I was lucky enough to be able to facilitate the Beyond Blogging workshop at YIS earlier this month with Jabiz. Trust me that I get the irony that blogging has fallen to the bottom of my to-do list too many times this school year and I was leading a workshop that was nominally about blogging. So with that said (and some inspiration from various participants) here is my bucket of bullet points. It is great not having the answers. Even when you’re supposed to. Every time Jabiz and I talked in the weeks leading up to the workshop we kept coming back to the fact that we don’t know what is beyond blogging. And I would get a little nervous/excited about that fact each time. We didn’t know the answers to the essential questions we thought should formulate the questions. We still don’t. And it was great that we could be honest with the participants. It can be a bit scary, considering people traveled a long way, to tell a room of adults that we don’t know the answers they came for. But honestly I hope that when I’m a participant in future workshops the consultant/teacher/leader owns up to the fact they don’t know the answers either. But education is too complex for a single answer to the big questions. I’m not doing everything right when it comes to blogging or the things that are beyond blogging. Far from it. In theory, I have some ideas of how to use digital spaces to encourage student voice and creativity. 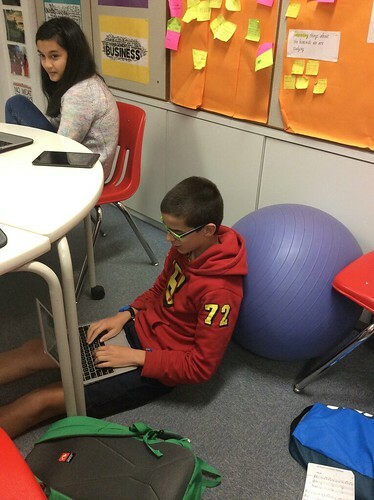 Sometimes , in practice, I create opportunities for students to use digital spaces (i.e. Twitter, Facebook, blogs, etc) in an authentic way. But in reality, I don’t do enough. I still require too many posts that are just reflections or worksheets online. 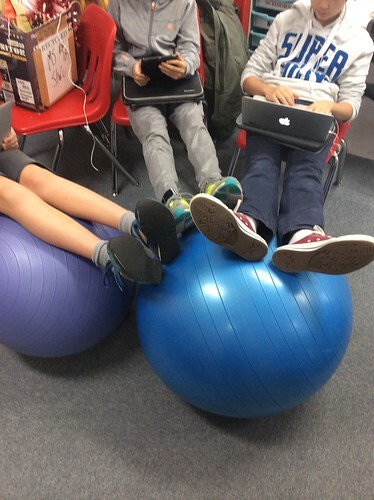 Despite modeling it, the blogs aren’t living spaces for my students. And I’m still struggling with how to do it. But the added bonus of not being a sage on the stage, was that I could be a learner too. I could have a conversation with people also grappling with these ideas. I was worried about differentiation for teachers I didn’t know and I shouldn’t have been. 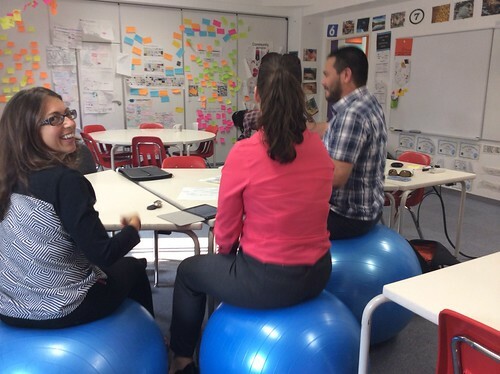 It can be hard to plan a workshop for 40 educators with different experiences, teaching philosophies, and levels of experience when it came to tech. But it was truly a joy watching people create products that were relevant to their schools and for their kids. ” async=”” defer=”defer”>The products (Vines, infographics, blogs, widgets, videos, and more) were vastly different and met the needs (I hope) of each participant. And it was a blast watching someone geek out with a new way of sharing, connecting, and creating with their students. And to be honest, these people weren’t strangers. Most of them I have met before at various conferences. Or talked to on Twitter. Or worked with a friend. There are no strangers anymore. Collaborative blogging and blogging for curation is something I want to explore more. Early in the planning stages Kim made the obvious suggestion that we model what blogs could be. I am moving towards the idea that blogs are places of curation rather than reflection. Bubblecatchers. So in that spirit, I created a collaborative blog for the weekend. Everyone at the workshop was invited to be editor and after some initial set up on my end, it became a place where we put our stuff. I wasn’t sure if it would work. And there were hiccups and things aren’t perfectly organized. But I really like that the weekends stuff, most of it unpolished, is online. And it may or may not be a place I go back to, but it served a great purpose for those few days. And I’m wondering how I can take this to other projects. I need to blog more. This is a cliche thing everyone who has a blog thinks on a pretty regular basis. It takes me a long time to blog. I want the perfect picture, the perfect phrase. But it doesn’t have to be that way. I’m not a perfectionist by nature, so why do I have to be one in this space. Why can’t I just post a post-it note with a short phrase of what I’m thinking that day? Or an instagram pic? Or screenshot a couple of tweets that speak to the things I’m thinking about? What can I do to keep building this space? So as usual, more questions than answers. But that is a space I’m normally pretty happy being in. A huge thank you to Jabiz for being such a great person to work with. And a massive thank you to everyone who came…it’s nice to know I’m not alone when it comes to this stuff. I am writing this as part of my Professional Growth Plan this year: Student Leadership. I love being a middle school Student Council advisor. To other people, planning middle school dances, trying to run meetings with 12 year olds, and organizing monthly assemblies with grades 6-8 students may not be the best ways to spend your spare time. 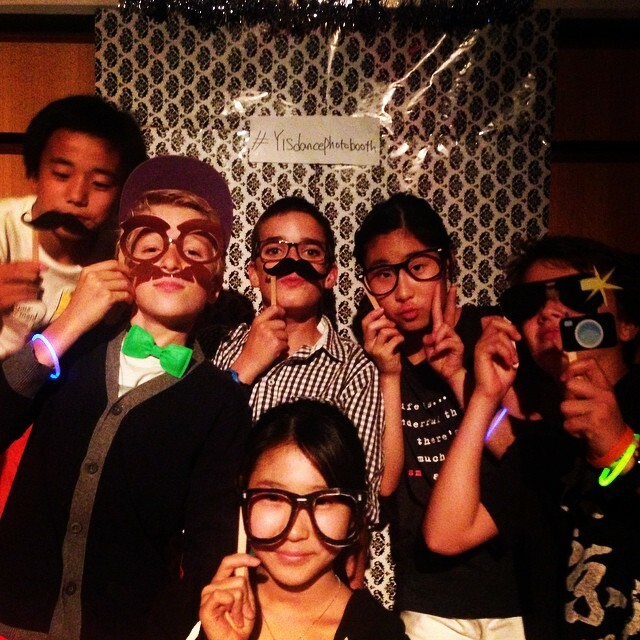 For me, I am energized by working with fun, silly, good-intentioned middle schoolers. Look at these goofballs…how can you not smile when working with these kids. I love seeing what they can accomplish and their belief that with hard work, they can accomplish anything. I see my job as StuCo advisor to create opportunities for my students to act as leaders and to shine. The less you see of me, the better. Despite my belief that my StuCo members do develop as leaders, it’s been a bit like throwing a non-swimmer in the ocean. Kids learn on the job. It’s a joy watching the upperclassmen (the wise and wizened 8th graders) teach the 6th graders how to get things done. But I haven’t set aside time for them to learn leadership skills. And when my amazing Vice-Principal, Susie Clifford*, suggested that we hold a leadership retreat for our middle schoolers, it seemed silly that it wasn’t something we didn’t do as a matter of course. So this Wednesday, Susie, Adam Clark** and I jumped in cabs with 12 students and headed away to school to the Yokohama Country & Athletic Club. And while the kids were there to learn things like public speaking, how to communicate with adults and peers, and project management, I learned just as much as they did. I learned our kids can teach. We gave the kids an hour to work in small teams to come up with a 15 minute lesson plan on their topic. To be honest, Susie and Adam and I thought they might struggle to fill the time. Instead they planned amazing lessons***. The group teaching about running agenda, created a beautifully planned agenda for their lesson, with action items and discussion points and then had each group (including the teacher group) act out a good meeting. The group teaching about communicating with adults had each group write an email asking for chaperones for a dance and then chose the best intro, body and conclusion. There were visible thinking routines, quizzes, pair-shares. I saw little things I know I do in my humanities class. I caught glimpses of my colleagues in watching this middle schoolers teach. It was awesome. And they were amazing teachers. I learned that it’s important to get away from campus for a day. It’s a special occasion for the kids (a nd adults) to leave campus, eat non-cafeteria food, and spend the day thinking about their roles as leaders. And it can’t be interrupted by all the things that happen at schools. It was special and we don’t do enough of those things for the kids. I learned we need more opportunities for cross-grade interactions. I truly enjoyed watching 6th graders work with 8th graders. And for 7th graders to switch between being mentors to the ones being mentored. If yo u remember middle school, the gulf between grades can be vast. But watching the kids laugh and hang out and play games and get to know each other was the best part of the day. And the community that is formed is invaluable. And we need more create more chances for the kids to learn from each other. I learned that schools should value student leadership. Student leadership is one of our school goals this year. It’s because of this that the school supported three teachers leaving campus for the day and paid for the leadership retreat. The belief is that if we train student leaders, they will then teach other students to lead. I truly believe that this can happen. I learned the kids want to lead. The last hour the kids worked on projects using the skills they developed. 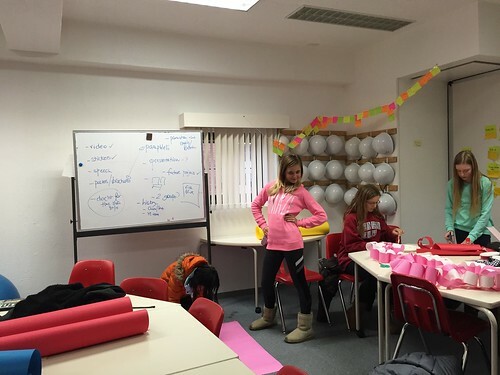 They worked on the assembly which would happen the next day (which was according to a 7th grader was “flawless”). They worked on fundraisers. They wrote a blog post about the day to share on the school website. 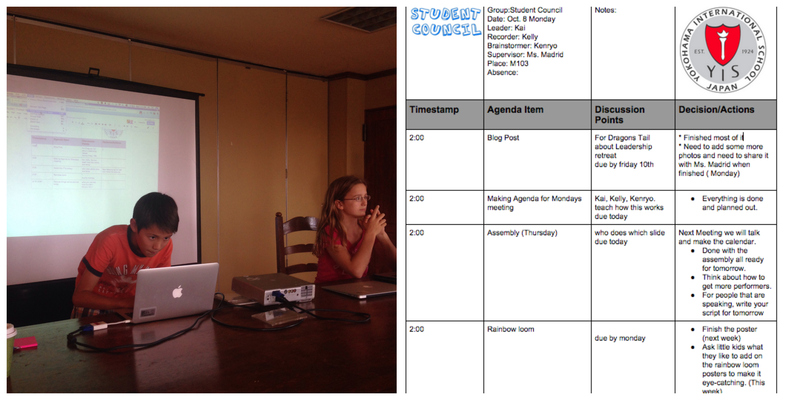 One group worked on setting up an agenda for our future meetings. And for the last 30 minutes, our incredible StuCo president Kai ran the meeting. Watching him run the meeting like a boss was proof the day was worth it. Today was a really fun day and I learned a lot about how to run meetings, and how to be a good leader. On behalf of the student council I would like to say thank you for everything you taught us today, and the time you put into it. I feel like we can now all be advanced leaders, and our meetings will become more student led. Hopefully, we can start to be more productive on our own in meetings. I think it goes without saying, but we’re already planning our next leadership retreat. * There should be no confusion, this leadership day was the brainchild of Susie. And she did the vast majority of the work getting us ready for the day. This day could not have happened with Susie…like so many other things at YIS. **This day also couldn’t have happened without the indomitable Adam Clark. He ran so many of the activities, games and took the amazing photos you see on this blog post. *** I did something similar a day later with my grade 11s. Their lessons were lecture based with maybe a small quiz. I’m not sure what that means, but I think it means something. I’m thrilled this year to be teaching DP History again. It’s been a while (my entire time at YIS) and I’ve missed it. But in my years focusing on MYP and middle school, I’ve picked up some new teaching strategies that I knew I could use with my grade 11 “historians”. So this year I hope to document how I challenge my DP students, get through the curriculum, keep the class relevant and ensure that the focus of the class is on student learning. One of the strategies I have started to use with my grade 11 students are the Making Thinking Visible Routines. Now I know that MTV is often thought of as an elementary exercise. Or as something good for scaffolding thinking with middle schoolers. And perhaps MTV may not the best fit for pre-college level course. But I also know that the kids in my classroom are 15 and 16 years old. They are just starting their Diploma Program process and they still need help clarifying their thinking. I also know that by grade 11, grades and GPAs really do matter and it’s not fair of me to just throw a test at them without at least trying to see if they had an understanding of the time period we are studying (the complicated Origins of WWI). And finally, I am not the same teacher that used to believe that lecture and quizzes was the only way to teach this course. So with that I introduced some making thinking visible routines (including a non-official routine) to see if my students were really thinking and engaging with the history we are studying. 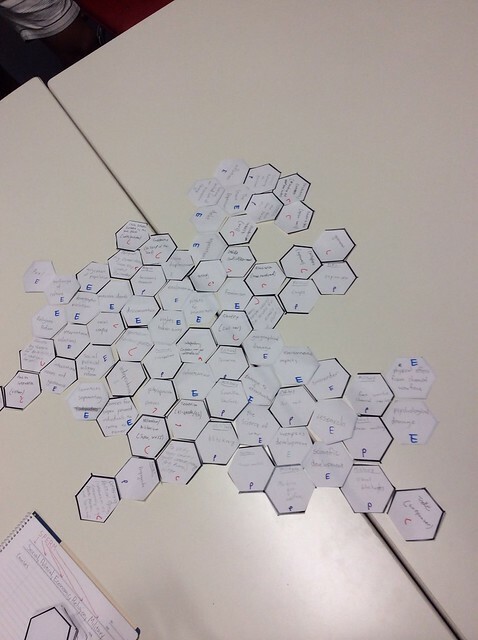 where either student or teacher writes key concepts on hexagonal cards, at the end of a period of learning, where the content behind each ‘headline’ is relatively clear to a team of learners. 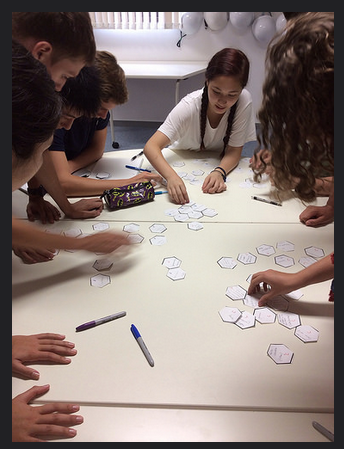 The students then place the cards together in the way that makes most sense to them – some ideas will connect to up to five others, others will lie at the end of a long sequential order, others still will appear in small outlying positions, on their own. For my purposes I wanted my students to being thinking about one of the major concepts we would be studying for the next two years: Causes, Practices and Effects of War. Working at pulling it all together. I found several advantages of using hexagon thinking. It allowed me a brief insight into what prior knowledge my students walked in with. It was actually impressive hearing them talk about what they already knew. It allowed for students to make connections. Sometimes I think my over-reliance on a neat GoogleDoc table means that my students separate ideas too readily. This allowed for my students to see how terrorism (for instance) could be a cause, a practice and an effect of war. They connections between ideas was vital and it was wonderful to see and hear them make the connection. The routine allowed me to introduce the idea of historiography. By asking students if their final product would look the same as students in different times and places, they realized that history can change depending on who is writing it. They even made a link to Theory of Knowledge in talking about bias and perspective. Pretty good for the first day of class. One of the most tricky bits of teaching DP history is ensuring the students understand the facts and the story, but think in terms of concepts and arguments. I want my students to move beyond the narrative and move to analytical. I love how they just sit on the floor and get to work. Now Origins of WWI is full of details and facts that can be hard to remember. So again, I had my students working in teams outline the events leading up to WWI for different countries. Out came the post-its. Russian events on pink, Balkans on green, Germany on yellow and everyone else on orange. Then we put them on a timeline, a piece a string down the middle of the table. They classified the events as alliances, militarism, nationalism, etc with letters. And the timeline looked good. They looked pretty proud of themselves. I then told them the timeline was no longer a timeline. They had to sort the events from most important factors leading to war and least important. We were now doing the tug of war routine. So they debated. And argued. And conversation started in a way it didn’t during the timeline. It set up the conversation for how narrative was not what we were looking for from DP History students. Having a timeline (in essay form) isn’t enough. They have to combine facts and analysis to formulate a coherent argument. The conversation they had was great. As you can see I have a small class, so everyone was participating and I could see that in general they were getting it. We now have the tug of war artifact hanging in the classroom and I’ve see kids go back to it. This was probably the biggest flop of the routines I used. In preparation for our first test, I handed students the official IB mark scheme (aka rubric). These things are full of teacher-talk. In addition, I have several students who are used to the American-style of grading (points of 100 leading to a A-F). I wanted my students to really read them and understand what was being asked of them. So as I handed out copies of the markscheme, I asked them to complete the See Think Wonder routine. What do you see as you read the rubric? What do you think about the rubric? What do you wonder? My grade 11s did not like being asked to break down their thinking this way. Several kids said they got it the rubric and didn’t have any questions. Other kids just jumped around without really looking at the document. The deliberateness (and maybe the childishness) of the routine did not resonate. I think students need to slow down and actually look at documents, pictures, evidence, etc. Often they are already a few steps ahead and they miss the details. This is detrimental to all students. It can be especially detrimental to history students who are asked to analyze and evaluate documents as part of their exam. The conversation we had was really valuable. While it wasn’t as focused as I might have liked, students were noticing good details that I think they would have missed initially. The kids who all said they “got it” actually ended up missing a lot. Forcing them to do the routine made them push beyond the assumptions. So far I’m incredibly pleased with how the routines have worked in my class. They go incredibly quick with grade 11s, which is great. It’s a valid form of formative assessment. Most importantly it means the kids are a vital part of the conversation, not just listening to me. Next step will be using the routines for teaching sources analysis. Which to a dorky history teacher like me is actually kind of exciting. I finally found a sensible and easy way to use video of me talking that my kids can watch again and again until they get it*. I’ve flipped the rubric. In MYP the rubrics for students can be complicated. And wordy. For an assessment that is all four criteria (like the one above) there is a lot to process. If you’re a middle school kid or an English-language learner, the rubrics can look overwhelming. If you are a parent used to a score out of 100 points, this may look foreign. Even the official name — Task-Specific-Clarification— can be gobblygook to my students. But with that said, I really appreciate how these focus on mastery and ability to think critically, investigate and communicate. My students can assess their work accurately and my grading is much more consistent and easier with a detailed rubric. So I had to find a way to make it a little easier for my students. This is what I do. I open Movenote. I upload the rubric straight from Gooledocs, because it something doesn’t work with Googledocs, I won’t use it. And when I go through the rubric with my students in class like I always do, I record myself**. Movenote then turns my recording into a video that I can embed into my blog. My kids then go back and watch it again and again. Or they can go back to the parts they are not sure of. Parents can see what is required on an assessment. And most importantly: I have not created any extra work for myself and I have helped my students. Like I said, a simple way flip my classroom. And with the exception of the awkwardness of watching myself on video, it’s a no lose situation. 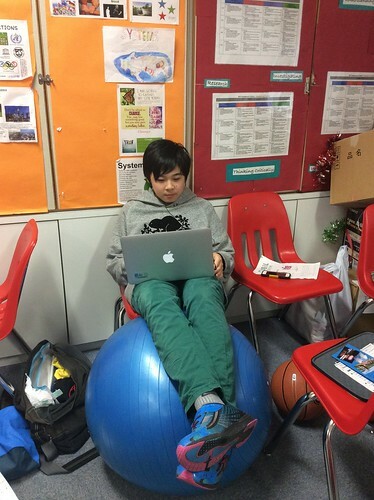 * I’ve talked about my hesitations with a “traditional” flipped classroom before. **It’s important that I go over it in class instead of just making it something kids watch for homework. That said, I have used Movenote to explain assignments when I’m out-of-school, which I think is great. One Grade 7 assignment I have done the past few years is a trial set during the Industrial Revolution, where students must answer the question: Should children be allowed to work in factories? We are in Industrial Revolution England and the country is growing at an incredible rate. The advancements in technology and the rapid urbanization of the country have lead to drastic changes. But not everyone is benefiting from the changes. Young people are being asked to work in factories, for long hours and low wages. Now the country is debating whether the welfare of children is more important than the economic and technological progress occurring in the country. You will be assigned a role in a trial we will be having in class. Some of you will be witnesses and other people will be lawyers. There are two sides being debated and you will have to persuade people that your position is correct for the time period during the industrial revolution. I’ve always liked this assignment. I like how easy it is to differentiate the roles for different students. 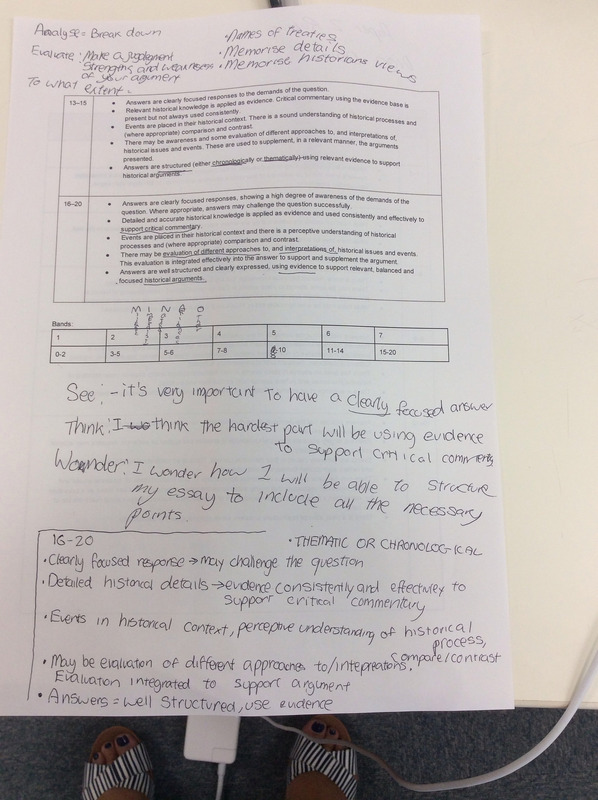 I like the fact that students are introduced to primary documents and have to use them to formulate an argument. I like the fact that students dress up for the trial and they get into the spirit of the trial and have fun. I also really like that students are forced to think about a perspective that they might naturally think is wrong; namely the position that people would argue for child labor. Trying to understand new, different, and abstract (i.e historical) perspectives can be difficult for grade 7 students. This year, I added a formative assignment prior to introducing the trial: an empathy map*. An empathy map is something used in Design Thinking,” to help you synthesize your observations and draw out unexpected insights”. Often used to understand a customer or client’s needs, an empathy map is being used in more classrooms as Design Thinking makes the move into more academic settings. Suggested by Adrian Baker, an empathy map is an excellent way for students to gain insights into historical figures. For this assignment, I used an empathy map to have students think about what life was like during the Industrial Revolution for children, factory owners, and campaigners. 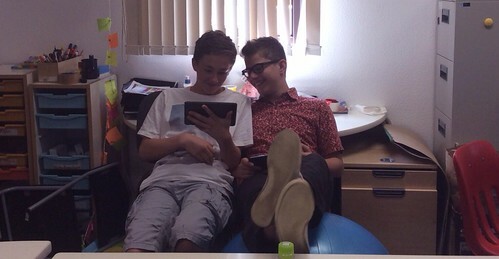 It turns out I had to be away from school when my students were working on their empathy maps. So I made a video explaining what they had to do. And because I was out, I made another one explaining how important empathy can be in understanding a historical figure. When I came back to school (after Spring Break), my student pulled up their empathy maps and immediately could remember the perspective of the person they read about. I could immediately assess their understanding of primary sources. 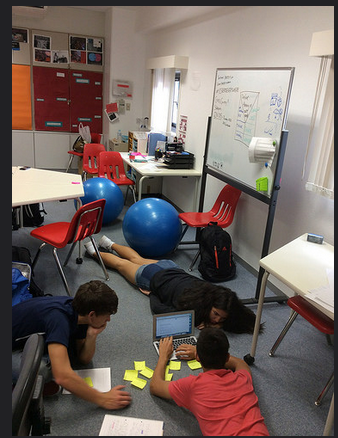 And they could immediately get to work at formulating questions for the trial based around what they observed and synthesized on their empathy maps . There is no doubt that doing the empathy map has strengthen my students’ understanding of the issue of child labor during the Industrial Revolution. It is a seemingly simple tool that allows my students to make their thinking visible and to gain a deeper understanding of historical perspectives. Hard to feel bad about that. *A big thanks to @davidjbland for putting together this great Google Draw template of an empathy map that let my students collaborate and share. As part of my Professional Growth Plan , I am going to be doing the periodic blog post on how I am trying to integrate Design Thinking into my teaching and learning environment. 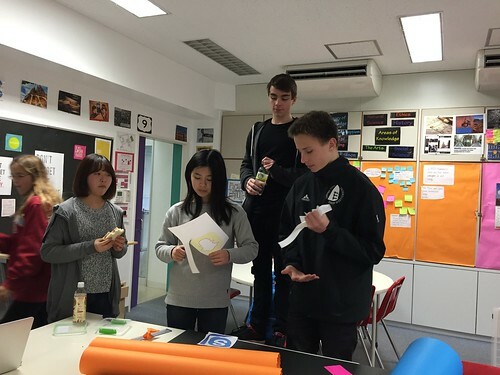 To learn more about the process of introducing and implementing the PGP at YIS, check out Kim’s blog. I am usually pretty open to trying things and not being sure where they are going to take me. That attitude is the one that has served me well. So after a semester or so of reading and learning about Design Thinking. it’s time to start sharing some of my ideas for where I’m going to be implementing. And in the process, I hope to synthesize all the ideas that I’ve been thinking about. This is perhaps the most natural for me. I really wish I was still teaching the Sustainability Inquiry unit in Grade 10, as this would be the perfect place to implement the Design Thinking in the curriculum. But with my current teaching responsibilities, I’m thinking my Grade 7 unit on the Industrial Revolution would be the best place. I think the focus on empathy inherent in Design Thinking could really strengthen how I teach the unit, as I want my kids to understand what life was like in the historical Industrial Revolution and to make connections with the modern-day work conditions. Last year, I did loads of Visible Thinking Routines in this unit and I think the two could easily complement each other. I’ve kind of let my project on modern day child labor melt away, but Design Thinking could be a way to reinvigorate it. The other place would be the end of Grade 8, when students have to create a sustainable community in Minecraft. I love my walls in my classroom. They are covered with post-its, I don’t have to decorate them, and they show the process my students are going through in their learning. In some ways, I’ve modeled my walls on the d.School dynamic walls. I love my walls so much, that they deserve their own post. I’ve already shared a lot of ideas with the other teachers in the Humanities Department. And I think there are other places in school we could use Design Thinking, especially Extended Essay and the Personal Project. This video suggests to me that our Service Learning program could also be informed by Design Thinking. While I’m not coordinating either of these, one of the wonderful things about YIS is that everyone is open to other people’s ideas and won’t be offended when I send forward some ideas I’ve learned from Design Thinking. This is perhaps the one I’m most excited about. I’ve been a student council advisor for most of my teaching career. I really love it, as you usually get great kids and you can set them loose. But I’m stagnating a little. We really are a machine in planning our assemblies, our dances, and volunteer work. So, what I would like to do is for my Student Council members to engage in a Design Challenge to find a way to make YIS a better community. Perhaps they would work with Elementary or High School student council. Perhaps they would work with administration. Or perhaps they would interview their classmates. This is the one I’m going to be really sitting down and working on in the coming weeks. I think my student council can empathize, ideate, sympathize, prototype (repeat as necessary) and come up with some awesome stuff. Perhaps because Design Thinking is still a bit of niche in education, I find the more I talk about my desire to learn more, the more people people reach out and share. I’m not quite sure what connections I am going to make talking about Design Thinking. But I do think there are some great possibilities to work with other teachers and academics thinking about how design can help our students.